Advertisers in India are unwilling to try new tools and set aside sufficient budget in programmatic, which may prevent them from getting the results the ad platform can provide. 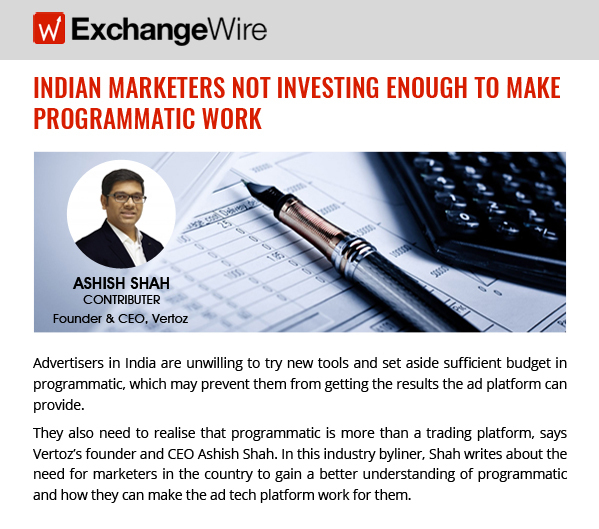 Vertoz’s founder and CEO Ashish Shah says, all the marketers are need to realize that programmatic is more than a trading platform. Programmatic in India is a fresh term and many people have yet to understand what it is. While it has high demand, and reach in the international market, Indian marketers still prefer the traditional ways of advertising. Indian marketers now must look at setting aside more budget and adopting programmatic. Unlike traditional advertising, programmatic provides transparency, viewability, targeting, and retargeting in real-time and a wide range of ad formats and channels on which they can run their ad campaigns. With programmatic gaining a foothold in India, organizations need to be more open-minded and embrace the change that online advertising is bringing to the local ad market. ExchangeWire provides global data and insight on Marketing Technology, Advertising Technology and Programmatic Advertising. Researching deep into the business of ad tech and programmatic advertising, they offer actionable market intelligence on emerging models and technology – as well as industry data and specific regional focus. ExchangeWire is always interested in any ad tech and programmatic related news across EMEA, APAC and LATAM. Relevant companies are encouraged to get in touch. We’re also interested in hearing from PR people working with companies in any of the areas named above. Vertoz is a leading programmatic company that offers engaging and innovative advertising and monetizing solutions. As we all know programmatic advertising consists of automated media buying, placement, and optimization of digital advertising, where both supply and demand partners are free from human intervention.